Welcome to the new 2018 version of the 1st Cab, Berwick-upon-Tweed web site. 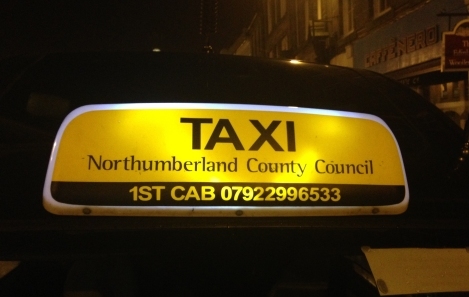 1st Cab are a taxi service based in Berwick-upon-Tweed, Northumberland, UK - we currently have 5 vehicles available, we have three wheelchair accessible vehicles, one regular 4 seat taxi and an 8 seat minibus. All three wheelchair vehicles can carry the wheelchair user as well as two extra passengers, without a wheelchair they are licensed to carry 4 passengers. We pride ourselves on being honest, reliable - and we turn up on time. 1st Cab have built up an excellent reputation in our area, and we always strive to improve where we can.